to reach speeds between to 5V 2400mA, regardless of the status of your computer or whether your hub is connected to a computer or not. 4. Easily add 6 USB 3.0 ports to any compatible system, fast and safe. 1. The actual charging speed depends on your device. To reach fast charging speeds (>5V 900mA) on the 4 standard USB 3.0 ports. 2.Some USB 3.0 devices(Apple SuperDrive etc) require direct connection to host ports. 3.2.4Ghz wireless devices (keyboards, mice, etc.) may not work around USB 3.0 ports. Try using a USB 2.0 connection instead. 4.The 2 BC 1.2 USB Port only support Android, Linux, windows system when using as data transfer. That means it will not transfer data with these 2 ports in Apple system(including MAC OS and IOS). 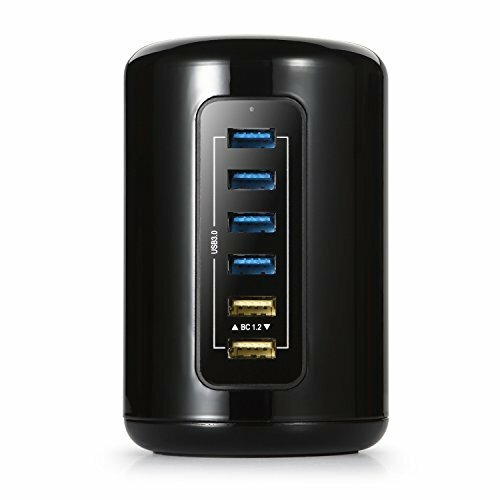 Built in 6 USB 3.0 Port( 2 of them are BC 1.2 with 5V/ 2.4A High Speed charging Technology) 1 SD card slot, 1 TF interface. If you have any questions about this product by iHarbort, contact us by completing and submitting the form below. If you are looking for a specif part number, please include it with your message.